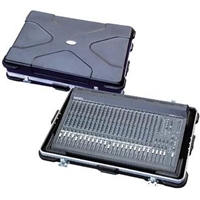 This ATA style universal mixing board family presents an amazing feature which transforms the interior into a snug cradle for virtually any non-rackable mixer. The patent pending "corner cleats" securely fasten to the Hook and Loop Fastener bed of the case to hold your board firmly in place. Accommodating 99% of all non-racking mixing boards. Backed by SKB's exclusive Unconditional Lifetime Warranty you break it, they'll repair or replace it forever!